If I had to define my ideal decorating style it would be updated traditional. I guess it is my Midwestern roots that shapes this love of traditional decor. I don't want a space that looks like my grandmother would live there though. I want my traditional look with an modern edge. I love to add a little Asian in a traditional room. 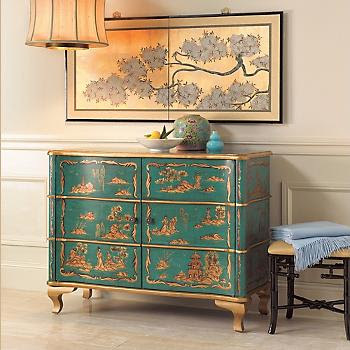 Whether it is a furniture piece or an accessory, I love the unexpected that adding Asian accents brings. I have a few great resources for Asian accents in the Phoenix area, but I wanted to highlight a few Asian beauties that everyone has access to. Gump's is a great resource for finding versatile Asian furniture and accessories. I love this cabinet and the teal color is wonderful. This would be great in an entry and even in a dining room to hold extra table linens, dinnerware, etc. I love display cabinets and this cerulean display cabinet is really great. I love to make sure that there is some black in a room, but the blue interior really pops and would be a fabulous backdrop to your collections. 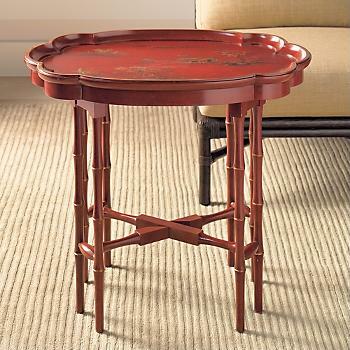 This red chinoiserie tray table makes the perfect side or end table. So elegant! I love a versatile stool. 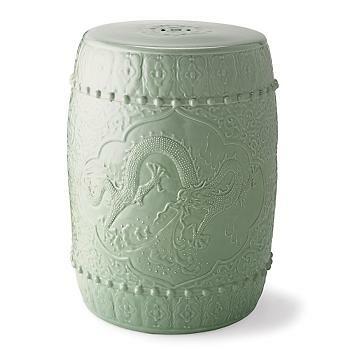 This celadon stool can be used as an end table, garden stool and extra seating. It is small and easily stored if needed. 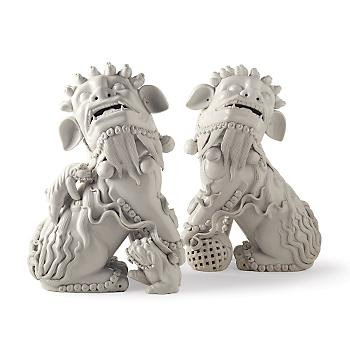 These Foo dogs say Asian, but the white color let's them fit into any decor. 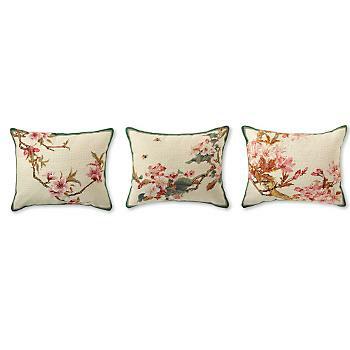 These cherry blossom needlepoint pillows would look great on a traditional style sofa. 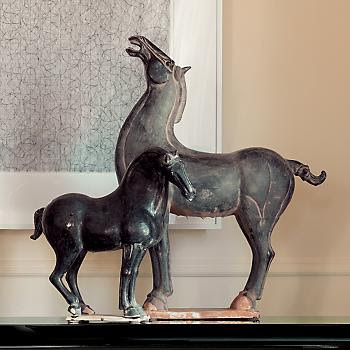 These Tang horses are a great accessory for your home and add subtle Asian flair to the space. 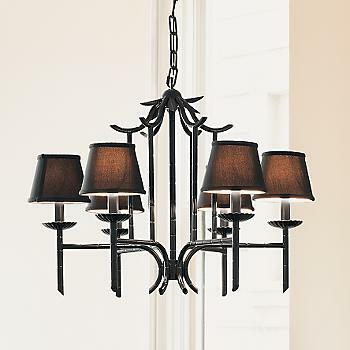 In the dining room, this bamboo chandelier would do the trick. 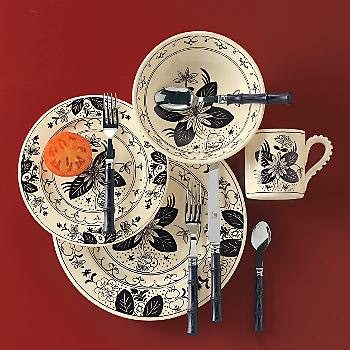 Last, but not least, I love this lotus noir dinnerware is hand painted with black lotus blossoms which are adapted from 17th-century Chinese art. It would be a great addition to any tablescape. Do you like Asian accents? Could you fit some of these Asian pieces into your traditional decor? I would love to hear your thoughts. I love the beautiful pictures you always post! they are cohesive and just such a feast for the eyes! ps I mentioned you in my post today...I hope you don't mind!! Great photos. Love the red table. I have a few old Asian rice baskets and two painted baskets. Love mixing these in with my decor. Oh! The pillows and the cerulean display cabinet could definately live in my house! I have so many goodies I want to show off in a practical way-that cabinet is perfection. I also like the pillows becuase their simple to swap out if you feel like it's time for a new look. Smart tips by adding small extras that really make an impresion. Thanks for sharing!